Republicans vs. Democrats on Israel Which party is better for Israel? This might be the tagline from conservative strategists’ latest brainstorm: according to Politico,, the Republican Jewish Coalition is spearheading a multimillion dollar campaign to woo Jewish voters away from their generations-long love affair with the Democrat party. The proposed PR blitz presumes that the party loyalty of American Jews can be weakened by a two-pronged attack. First, invoking American policy toward Israel. Second, attributing the resurgence of anti-Semitism to liberal political policy. Most American Jews are deeply conflicted about the State of Israel. As I explain in my article, “Why Jews are Liberals,” the average American Jew has largely abandoned every outward vestige of his Judaism. All he has left is the echo of Jewish idealism, the mission to elevate human society by serving as a model of virtue. That’s good as far as it goes. But untethered from the practices of traditional Jewish observance, that idealism has no discernible outlet except through the causes of social justice – which, perforce, require supporting every underdog against every establishment, any David against any Goliath. Based on that template, the First World, along with its every manifestation, is intrinsically evil. Western Civilization, capitalism, the tech industry, and economic success – all these must be lumped together as villains and oppressors. The success of American Jews themselves is atoned for through Jewish guilt and active support for victims. This is why the perverse rewriting of history that brands Israel as an aggressor and occupier garners so little objection from American Jews. It doesn’t fit the narrative; therefore, it challenges the basic assumptions of what American Jews believe. See no evil; hear no evil. That’s why American Jews, 78% of whom supported Barack Obama in 2008, continued to support him overwhelmingly in 2012. Despite a long record of undisguised and unapologetic animus toward Israel, Mr. Obama retained 69% of the Jewish vote when he ran for reelection. There’s little cause to believe that Donald Trump could ever erode that margin significantly further. Despite many generations of history proving otherwise, secular Jews have long believed that anti-Semitism is the natural consequence of drawing attention to themselves. The remedy is to blend in. And, since most American Jews associate only with liberals and progressives, they can’t even conceptualize deviating from the party line as a viable option. It’s worth noting that the large majority of Orthodox Jews identify themselves as politically conservative. 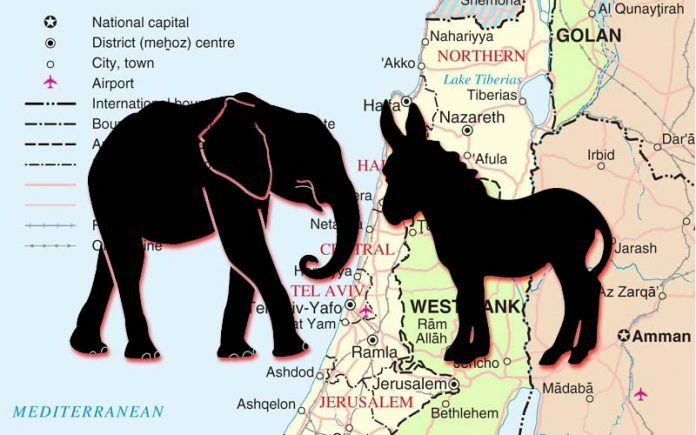 The failure of social justice programs, abandonment of traditional values, and militant hostility toward Israel provide more than enough reason for the religious to reject progressive liberalism in general and the Democrat party in particular. What strategy should be employed to turn American Jews? The same one that should be used toward mainstream liberals. Rather than trying to shame them by challenging the political allegiance, quietly leave them agonize over their party’s abdication to the extreme left wing. They may not vote Republican, but they may stay home and note vote at all.